Practically everybody loves barbecue chicken and it's such a favorite for any cookout so I've prepared some tasty BBQ chicken recipes for you to try. What's great about cooking barbecue chicken is that it's so easy to do and with a few simple ingredients anyone can produce fantastic results. Be patient. If on gas or electric, cook it gently. 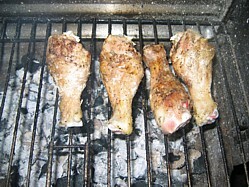 If on charcoal allow at least 45 minutes for your charcoal to settle down before even considering to put the chicken on. Cooking barbecue chicken should be about spit and sizzle. If there’s any sign of a flames, get the tongs and whip the chicken off for 10 minutes. Let the coals settle and start again. I have a home made barbecue design that allows me to raise and lower the grill plate according to the state of the charcoal. It’s a great asset for chicken and gives me that extra “volume control” that any gas or electric grill offers. Then again, it’s the fat from the skin that causes the flames so the other option is to take the skin off. I know there’s lots of flavor in the skin but apply one of my barbecue rub recipes and there's an abundance of regional styles that you can experience. Click here for the basic Barbecue Chicken Rub - Easy to make and basic only in name. It's still packs a punch. Pineapple Chicken - Chicken breast stuffed with crushed pineapple and covered in homemade pineapple syrup. Grilled Chicken Kiev - Chicken breast stuffed with garlic butter. Beer Can Grilled Chicken - It's in the grilling section but you must be able to use your grill for indirect cooking. Turkish Style Grilled Chicken Thighs - Marinated overnight in paprika and yogurt for a delightfully succulent finish. Caribbean Chicken Rub - Lot's of soft spices and sweet citrus juices. Caribbean Jerk Chicken - Compare this to any shop bought mix and you'll never buy another pre-mixed rub. Barbecue Grilled Chicken With Lemon & Basil - influences from Italy. Indonesian Grilled Chicken - This recipe is courtesy of Rina from Jakarta and it's too god to miss! Tex Mex BBQ Chicken Wings - Sweet and heat. Perfect finger food. Grilled Chicken Fajitas - Rub onto chicken breast and make a healthy wrap with my vegetable suggestions. Quick and easy. Chicken Curry Fajitas - Tex Mex origins with an Indian theme, it's fusion cooking in the extreme. 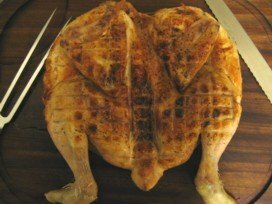 Spatchcock Chicken - Where we effectively cook the chicken inside out, I saw this first done many years ago in Portugal and it’s still one of my favourites cooking methods today. Spit Roasted Chicken Probably the most traditional method for cooking chicken, the rotisserie method is great for continuous basting and a really succulent result. Thai Spicy Grilled Chicken Recipes - If lemon, chili ginger and garlic is your thing, then look no further. Yakitori Chicken - Marinaded, skewered chicken in sweet yakitori sauce. Japanese cooking for health and fitness. Grilled Chicken Kabobs - Marinated in an oyster sauce mix. Chinese Chicken Wings - A very simply rub to get you that classic Oriental flavor. Ideal for when you're short on time. Fennel Grilled Chicken Wings - A subtle aniseed flavor is the perfect seasoning for a delicious appetizer. More Grilling Chicken Wings - I've called it Texas style because of the chili and cumin mix. Chicken Salad with Citrus Fruits - A great healthy option. This does require a marinade though so do leave at least a couple of hours for preparation. Indian Spiced Kebabs - Traditional Indian spices in a yogurt marinade. Requires 24 hours. Butter Chicken Recipe - Marinated grilled chicken breast in a rich creamy sauce. Indian cooking at its best. Chicken Tikka Kabobs - beautifully succulent and slow grilled barbecue chicken in the traditional way. Easy Whole Smoked Chicken - Whole barbecue chicken injected with olive oil then cooked long and slow over apple wood. Smoked Chicken Breast Salad - Taking the smoked chicken in the recipe above, adding a few extra flavours and turning out simply the most moist chicken breast that you ever will have tasted. Plank Cooked Chicken with Garlic and Chilli - Chili, garlic and cumin.....fantastic! Plank Cooked Chicken with Paprika - It's not fancy but still tastes great and this one is a fast cook too. Tandoori Chicken Breast - This is where you can truly take advantage of your ceramic designed barbecue and use it as a tandoor. Chicken Tikka - Skewered marinaded chicken thigh meat - one of my favorites and really spectacular to cook with friends. 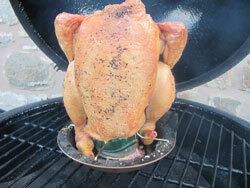 Traditional Roast Chicken - Just use your kamado like a traditional roasting oven. How do we know when chicken is done? The old way was to simply prick it with a skewer and if the juices run clear then it’s done. 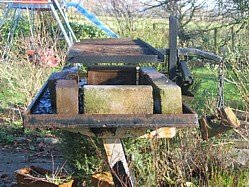 With modern farming methods that doesn't stack up anymore. Read my guide as to why a bbq thermometer is best. Because of the health risks many people are put off barbecue chicken. Please don’t be put off, follow my recipes and chicken off the BBQ grill will be fantastic and awesome out of the BBQ smoker too.